Following 2 brilliant young musicians for a year in their burgeoning musical careers gives the viewer the visceral thrill of experiencing talent at the highest level while unfolding the angst and struggle of carving out an actual career in an overcrowded musical landscape with an ever shrinking audience. Playing For Real is a one hour documentary that takes an intimate look at the extraordinary difficulties of creating a career in big time classical music. "Playing For Real" follows two brilliant unknown musicians at the start of their careers. Both artists have won the Young Concert Artists International Audition which offers its winners the most desirable of all prizes: a debut in New York with 3 years of nurturing, grooming and careful hands-on management. Our subjects are Mayuko Kamio, a 14 year old Japanese violinist who is starting her American performing career as she attends both Jr. High School and Juilliard, and Adam Neiman, a 22 year old American pianist who has already played several hundred concerts and as the film closes leaves the YCA nest to join the roster at ICM management. The verite doc is laced with interviews with many stars of the music world who were discovered by the 40-year-old YCA; some of these artists include: Emanuel Ax, Dawn Upshaw, Ruth Laredo, Jean Yves Thibaudet, Michael Tilson Thomas and Gerard Schwartz. "Playing for Real" premiered on WNET/thirteen in NY at on April 3rd and will be seen on many other PBS stations. Playing For Real" is a one-hour documentary that takes an intimate look at the extraordinary difficulties of creating a career in big time classical music. The film follows two prodigious unknown musicians at the start of their performing careers. Both artists are Young Concert Artists (YCA) International Competition winners. YCA auditions over 500 musicians annually seeking the very best young musicians from music schools around the world. Their winners are highly trained musicians who have the musical chops necessary to have a career but lack the experience, contacts and maturity to begin one. For 40 years YCA has proved remarkably successful in finding and launching these unknowns talents. "Playing for Real" was filmed over the course of one year and features three characters: Susan Wadsworth, legendary founder of YCA who tends to her artists' every professional need, often breaching the line between manager and surrogate mother. We also follow two of her artists - Mayuko Kamio, a 14 year old Japanese violinist who, at Susan's request, moves to New York with her mother to start her American performing career. Prodigies often burn out and have real troubles as young adults, so Susan's close attention to Mayuko's needs as a young teenager learning English, attending school and starting to perform in America, are paramount throughout the film. Our other subject is Adam Neiman, a 22 year old American pianist who has already been with YCA for several years and has hundreds of concerts under his belt under Susan's management. Despite his success and performing experience, Susan is still concerned with his personal style - long hair, beard, etc. - and she'd like to get him back to the clean-cut boy he was when she found him at Juilliard 3 years before. 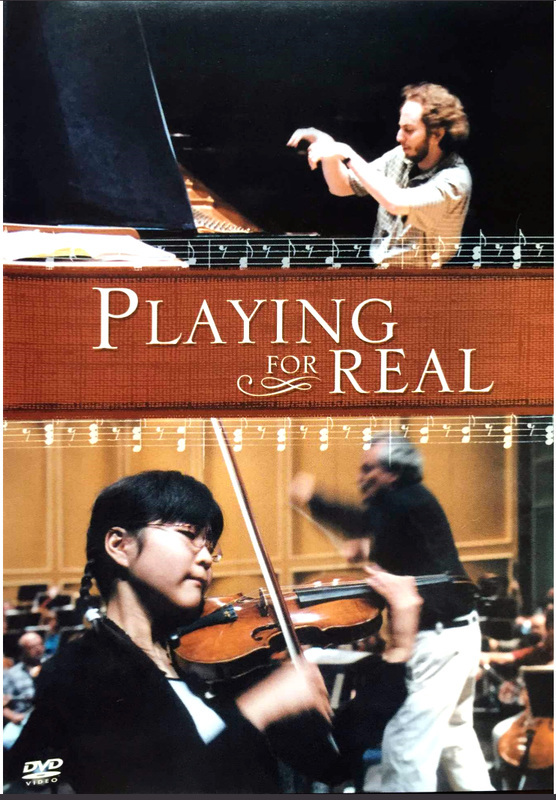 "Playing For Real" is a verite documentary and has no voice-over narrator but it is laced with interviews with many stars of the music world who were discovered and launched by YCA; some of these artists include: Emanuel Ax, Dawn Upshaw, Ruth Laredo, Jean Yves Thibaudet, Michael Tilson Thomas and Gerard Schwartz. These interviews deepen the story of Adam and Mayuko as they tell of their own experiences professionally growing up under Susan Wadsworth. "Playing For Real" includes a scene with Isaac Stern reminiscing on his own professional beginnings; this shooting was the last time Stern was filmed before he died. "Playing For Real," an Aronson Film Associates Production, is produced and directed by Josh Aronson, the director of the Academy Award nominated "Sound and Fury."